Cold-brewing coffee is a nice way to cut down on acidity while raising flavor in iced coffee. It's super easy, and much more affordable than a trip to Starschmucks. Yes, it's a it time consuming to start, but perhaps a little calculation will help you out. I'm not feeling coffee snobbish right now, so I buy what's cheap. I do have my moments, when I specifically go to the local roasters, but right now I'm poor, and I'm using Dunkin Donuts Cinnamon Roll, because it was on sale for $5.99 a bag USD. It's not my most favorite of the pre-ground, bagged coffee. That would be Archer Farms, the Target brand, but it will do when the others are 7.99 and I have $10 for groceries for the next 2 weeks (Mom, if you're reading this, don't worry, it was before my summer pay kicked in, and the Farm Share makes sure I have more than enough food!). But, I also keep some rather "fancy" goods around the house. Even using the super expensive vanilla bean paste, with expensive sugar, this coffee costs less than a tall Starschmucks iced coffee with a flavor shot. And in that one you're getting watered down coffee because of the ice cubes, and a lot less coffee because my calculations are before ice is added-theirs is after. You can sub the expensive sugar for plain white (0.009 cents per serving, 0.26 per batch), and the expensive vanilla for extracts of any flavor (0.94/0.04). So, for $2 or more, you can have a mediocre iced coffee, watered down, with one of the cheapest flavored syrups available, or this for $0.77-$1.50. In this version, I'm going for all of the flavor, but not the concentrate. This is why it's a two step process. The first batch is a 2 day event, but trust me, it's worth it. First, you need a container. I save glass containers for storage, so I have a lot. You may do this in more than 1 container. I have a 3.5 cup mason jar I like to use. A large spaghetti sauce container will do the trick as well. Now, a lot of people say 3.5 cups water to 3/4 cup coffee, but to me that makes more of a concentrate, and I want a cool, refreshing drink I won't be watering down. Why am I not watering it down? Because the first batch is for coffee ice cubes! In the morning, combine 6 Tbsp. of coffee with 3 1/2 cups filtered, cold water. Lid it, and give it a good shake. In my mason jar, it's water to the 3 1/2 mark, and coffee grounds to where the lip starts. Then, place it in the fridge, and forget about it until bedtime. 12 hours later, strain it through your mesh coffee filter (nice and reusable, and included with just about any good coffee pot kit) a bit at a time into your 2 cup measuring glass. Then, pour it into ice cube trays to freeze overnight. Rinse your jar, and repeat with another 3 1/2 cups cold, filtered water and 6 heaping Tbsp. of coffee. Shake it like you shake your money-maker, and once again toss it in the fridge. 12 hours later, shake it one last time, strain it into a clean bowl, and then empty your grounds and rinse your jar with cold water. Pour the coffee back in and store up to 3 days. Coffee grounds, btw, are great for several flower beds and compost piles. Stir sugar and water until it's as dissolved as you can get it. Stir over heat to fully dissolve, and bring it just to a low boil until all is dissolved. Once you see those bubbles a little bit, remove from heat and cool. Once completely cool, store in glass jar. Add vanilla bean paste, shake, and refrigerate. Keeps for freaking ever, but remember a little goes a long way! 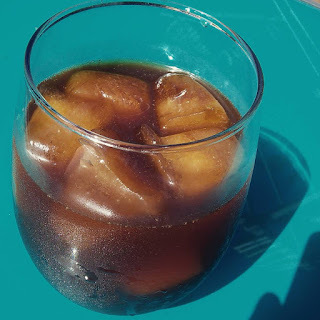 To serve, pour strained cold-brew coffee over coffee ice cubes. Add syrup to taste. I wanted it sweet this morning, so I use 1 1/2 Tbsp of syrup when I use it. I recommend adding it by the 1/2 Tbsp. Some mornings I just drink it black. It all depends on how I'm feeling when it comes to calories. Either way, because it's so sweet, even in this amount it only adds about 41 calories. All together, 40-50 calories. Most coffees are less than 5 calories per cup and a bit of potassium. Since this coffee is so smooth, and so flavorful, I often drink it straight up black.